Michigan will host its spring practice game this Saturday, and a hand full of prospects will make unofficial visits to Ann Arbor. The spring game is always an exciting time for recruits, as they get to check out and get a “feel” for the campus and stadium. 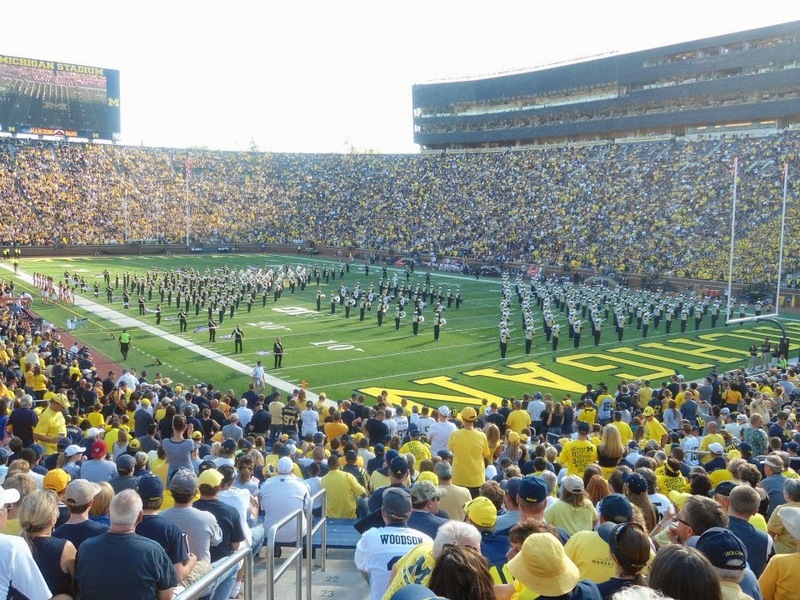 This year however, Michigan has installed a new offense and recruits will be looking to see how the new system can fit their skill sets in person. Could this spring game be the shot in the arm Michigan needs to catch up on the recruiting trail? The Entire Core6 program will also be in attendance this weekend. Ferns, Hayes, Hill and Ross are all relatives of current Wolverines players. I don’t see how this can be taken as anything but positive. Having people you already know, let alone are related to, can make the transition from high school to college much easier. Also, 2015 TE target Tyron Wheatley Jr., might make the trip to Ann Arbor this weekend. Wheatley and his father have planned to make multiple visits this weekend, and it’s all a matter of being able to fit Michigan into his busy schedule. If not, Wheatley Jr. will definitely be on campus at some point in the summer. 2015 5 star OLB Justin Hilliard named his top 10 recently this week. 2015 RB Mike Weber will take an unofficial visit to Columbus this weekend. Michigan has recently gained momentum in Weber’s recruiting. Before the hiring of Coach Nussmeier, I would have put Weber's chances at coming to Michigan in the slim to none bracket. Since then, the coaching staff have made Weber a priority and made it clear that Michigan wants him. The change to the pro-style offense in recent years definitely helps Michigan’s chances. Cass Tech has long been a pipeline school for Michigan, and losing recruits back-to-back years to Ohio State won’t be good for Hoke and Company. 2015 QB target David Sills, who committed to USC in 2010, visited West Virginia on Thursday. Sills has seen his recruitment pick up steam since 5 star QB Ricky Town flipped to USC. Sills was on campus last month and does have a scholarship offer in hand. Michigan would like to take a QB in the 2015 class and has only handed out 4 scholarships so far, with all 4 being committed to schools already. Freddy Canteen and Brandon Watson both played with Sills last year at Eastern Christian Academy. 2016 Junior ATH Darrin Kirkland Jr. was offered a scholarship Friday morning. Throughout high school, Kirkland has seen snaps at WR/RB/OLB and MLB. Michigan will recruit Kirkland as a LB, as he fits the exact mold of what they are looking for at the linebacker position. Great on the pass-rush, Kirkland sheds blocks, and has excellent field vision. Watching his highlight tape, it’s hard to believe that more top tier schools haven’t jumped at the chance to offer him a scholarship. Kirkland plans to announce his decision on May 30th, so look for the staff to get him on campus before for an unofficial. Former Alabama offensive lineman Chad Lindsay will also be attendance this weekend. Lindsay graduated last year after starting 4 games for the Crimson Tide, and still has one year of eligibility left. With Michigan having a young/inexperienced o-line, having Lindsay transfer would benefit the program immensely. I think the chance to play for Coach Nussmeier again, and have a chance to be a starter puts Michigan over the top for his services.